What kinds of health problems do geriatricians treat? My mother, who's 80, takes several different medications for various health problems, but hasn't been feeling like herself lately. I'm wondering if she would benefit by seeing a geriatrician in place of her regular family doctor. If your mom is dealing with a variety of health problems and is taking multiple medications, a visit to a geriatrician may be just the antidote to help get her back on track. Here's a breakdown of the different types of health conditions geriatricians treat and some tips to help you locate one in your area. For starters, it's important to know that geriatricians are family practice or internal medicine physicians that have had additional specialized training to manage the unique and, oftentimes, multiple health concerns of older adults. Just as a pediatrician specializes in caring for children, a geriatrician is trained to provide care for seniors, usually over age 65. While most doctors, and even general practitioners, are trained to focus on a person's particular illness or disease, geriatricians are trained to look at all aspects that can affect elderly patients -- not just the physical symptoms. They also often work with a team of other health care professionals like geriatric-trained nurses, rehabilitation therapists, nutritionists, social workers and psychiatrists to provide care. And, they will coordinate treatments among a patient's specialists. Patients who can benefit from seeing a geriatrician are elderly seniors with multiple health and age-related problems such as cardiovascular disease, stroke, confusion and memory problems, Parkinson's and Alzheimer's disease, diabetes, hypertension, depression, respiratory problems, osteoporosis, arthritis, chronic pain, mobility issues, incontinence, vision and hearing impairment and trouble with balance and falls. Geriatricians are also particularly adept at tackling medication problems. Because many seniors, like your mom, take multiple medications at the same time for various health conditions, and because aging bodies often absorb and metabolize drugs differently than younger adults, unique side effects and drug interactions are not uncommon. A geriatrician will evaluate and monitor you mom's medications to be sure they are not affecting her in a harmful way. Geriatricians can also help their patients and families determine their long-term care needs, like how long they can remain in their own homes safely without assistance, and what type of services may be necessary when they do need some extra help. But not all seniors need to see a geriatrician. 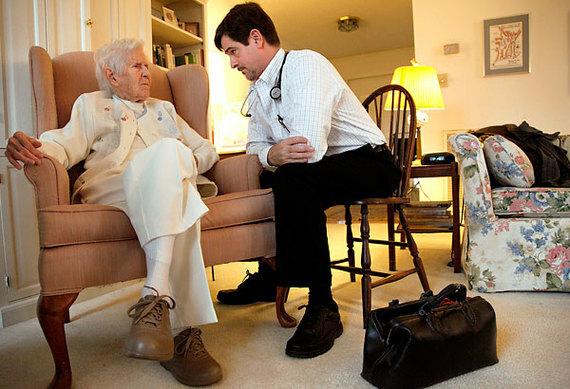 Seniors who have few health problems are just fine seeing their primary care physician. Unfortunately, there's a shortage of geriatricians in the U.S., so depending on where you live, finding one may be challenging. To locate one in your area, visit the American Board of Family Medicine website where you can do a search online. Or use Medicare's online Physician Compare tool. Just go to medicare.gov/physiciancompare and type in your zip code, or city and state, then type in "Geriatric Medicine" in the "What are you searching for?" box. You can also get this information by calling Medicare at 800-633-4227. Keep in mind, though, that locating a geriatrician doesn't guarantee your mom will be accepted as a patient. Many doctors already have a full patient roster and don't accept any new patients. You'll need to call the individual doctor's office to find out.